I was impressed with myself – anyone who wants to make use of that quote, please ensure you attribute it to me – Simon Kaheru, February 10, 2012. As you go about your work, think about these guys above. If we were a more organised society, the government people in charge of innovation (would that be the Ministry of Technology and Industry or something – which we don’t have…or the Uganda National Institute of Science and Technology?) would run up to that village, take those kids up and insert them into some programme that will make them great inventors. It is kids like these above who are going to come up with a once-and-for-all solution to the potholes in Kampala – or the answer to all the nonsensical problems we suffer on a daily across the country. Discussing this on another forum, Guma declared himself to be too shy to make his comments public, but suggested that the problem with the above is that the government might not be willing to take the kids and their ideas up. I think otherwise – the objective is not for the government itself to pay but for us (the private sector and whatnot) to make use of them. Then, the money that has been rolling out in $s to import those tables you see by the roadside will instead stay here and get used to do more serious things or perhaps get channelled into buying tractors and more useful equipment than pool tables. Meanwhile, hotels will begin to crop up in Moroto with mud and wattle furniture because these kids have shown us it is possible…and it will be listed as one of the world’s great places to visit because of the novelty of sitting on a mud bench as one sips stuff like Ugandan grown and brewed tea. 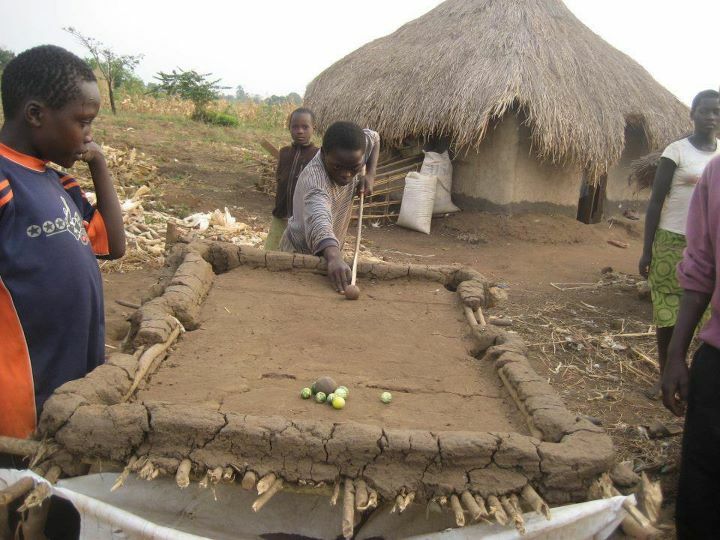 This is surely African innovation, these guys deserve a Nobel prize for innovation! @Mategyero: Indeed – but instead of a Nobel (and I hope I don’t sound too crusader-ish), what about we create an African-inspired prize that more of us will be able to identify with rather than just identify? What happens when it’s a rainy season? Good innovation though. @Samson: That’s easy – they build it in such a manner that it does not run off due to rains. Our ancestors built mud and wattle houses that stood centuries in spite of the rain.